As more consumers do their research and make purchases from their tablets and mobile phones, companies are scrambling to develop solutions that take advantage of this growing digital marketplace. Businesses also understand that consumers are becoming accustomed to the enhanced shopping experience provided by the latest apps on their mobile devices. Many advertisers and marketers are also implementing mobile barcode campaigns with their traditional marketing and taking advantage of the additional statistics captured by a QR code management system. The value of barcodes in tracking inventories is evident in any modern retail environment. Many of us even scan and pay for our groceries when we need to save time in the checkout lanes at our local store. NeoMedia has been at the forefront of mobile barcode technology for businesses and marketers, offering solutions for mobile barcode creation as well as QR code management systems. Whether it’s a barcode scanning app that helps users research pricing or one that scans a QR code to provide extended product information, consumers are enjoying a more personalized shopping experience with scanning technology. A QR code management system from NeoMedia collects data from your code enabled marketing campaigns and provides valuable reporting and insight about the interactions of shoppers with your environment. 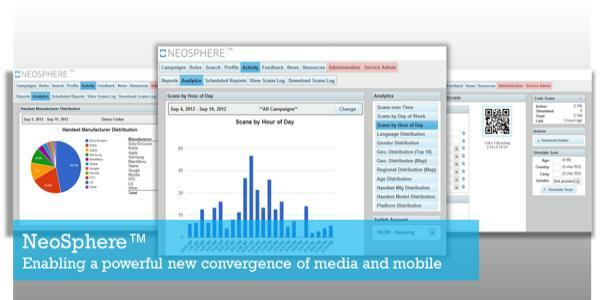 Enterprise solutions from NeoMedia can manage the data from all of your mobile barcode campaigns in one interactive dashboard. Take advantage of the simplicity of our QR code management systems and start gaining valuable insights about your consumers today!